You can now brunch in Sunrise, too! 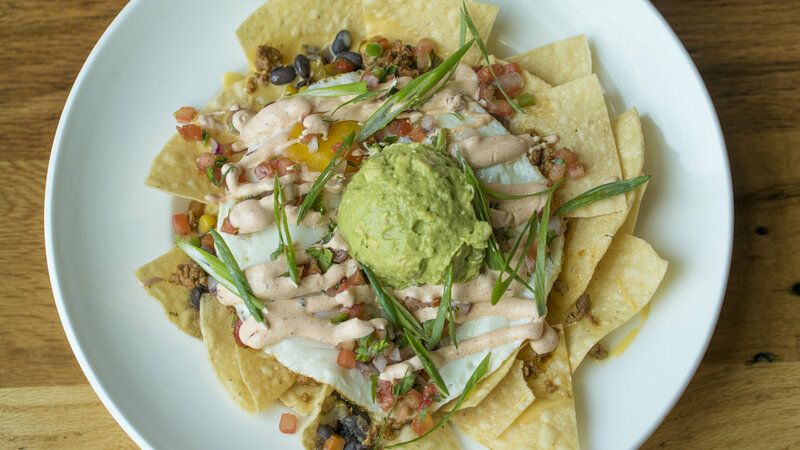 This weekend, MatchBox at the Colonnades in the Sawgrass Mall launched their new made-from-scratch brunch menu. If you have been on my blog before you know I love the food at MatchBox. The same holds true for this new brunch menu. This is where it’s at! Apart from the food being well-made and delicious, the atmosphere is perfect for a brunch vibe. There is indoor and outdoor seating surrounding a large center bar, fire pits and brick layout throughout the restaurant. Added plus: it’s in the Colonnades so post brunch shopping is easily accessible. We started off our brunch with the chilaquiles, which are their tasty breakfast nachos. I have since then decided breakfast nachos are definitely my thing. The chips were perfectly crispy, topped with a chorizo, pico, green chile sauce and a chipotle sour cream (YUM). The fried chicken + grits are served on a skillet, so you know it’s fire. The chicken was tender and served with andouille sausage butter sauce and a fried egg to set the breakfast tone. Other brunch items include cast iron cinnamon buns that come with maple cream cheese icing, chicken and waffles, NY strip steak and eggs served with breakfast potatoes and grilled garlic baguette and a garden skillet loaded with veggies and breakfast potatoes. I definitely recommend the blueberry muffin French toast. So fluffy!!!!! Brunch hours will be on Saturdays from 11 a.m. – 3 p.m. and Sundays from 10 a.m. – 3 p.m.